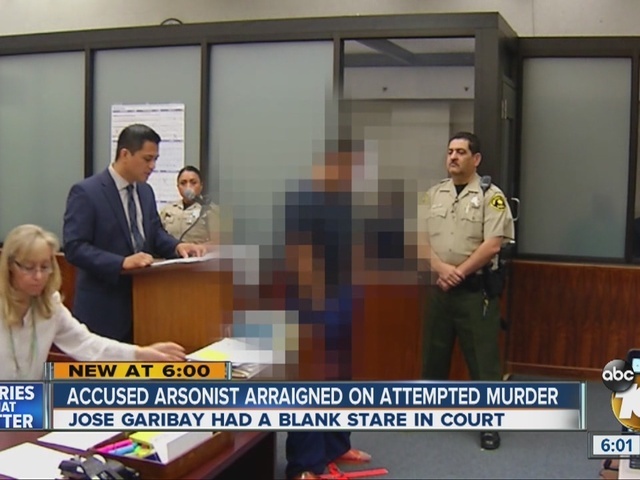 A man accused of dousing a stranger with a flammable liquid in a busy Oak Park-area parking lot and setting him on fire, leaving the victim hospitalized in grave condition, pleaded not guilty Wednesday to charges of attempted murder, aggravated mayhem and torture. Jose Ricardo Garibay, 26, was ordered held without bail. He faces life in prison if convicted, said Deputy District Attorney Amy Maund. "It's a horrific case," Maund told reporters. Special circumstance allegations could be added if the victim, 39-year-old transient Julio Edeza does not survive, the prosecutor said. Edeza's aunt, Irma Aguilera, said he has undergone surgeries and is in a drug-induced coma. "He's a fighter," she said of her nephew. Garibay was arrested near his home in the 6200 block of Estrella Avenue on Monday after a police sergeant acting on a tip from the public spotted a black older-model Toyota pickup truck linked to the attack on Edeza. Garibay surrendered without incident, behaving politely and seeming "very matter-of-fact about the arrest," Lt. Manny Del Toro told reporters. About 11:45 a.m. Sunday, witnesses saw Edeza conversing with another man next to a parked truck outside a Rite Aid store in the 1700 block of Euclid Avenue moments before being set ablaze. The assailant then got into the vehicle and fled. The victim was admitted to UCSD Medical Center in critical condition with severe burns over most of his body. Investigators have not determined a motive for the apparently random attack, Del Toro said. 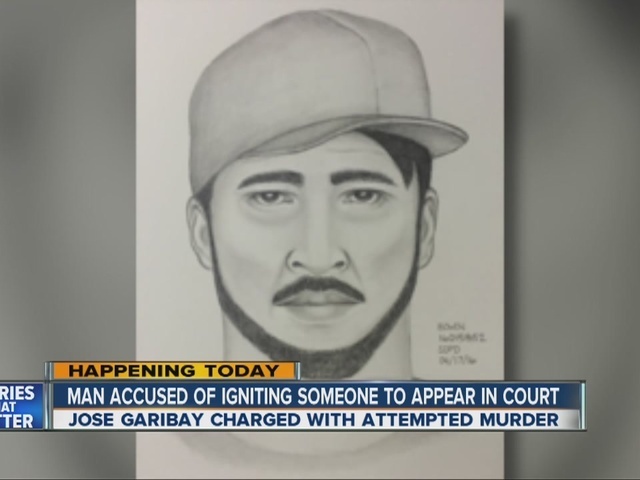 On Monday morning, police released a surveillance photo of the truck and an artist's rendering of the perpetrator, prompting a number of calls from people reporting possible sightings of the vehicle or suspect. At the time of his arrest, Garibay was in the truck with a person not connected to the crime. The suspect was taken into custody on two outstanding misdemeanor warrants, but detectives subsequently found "additional evidence and information and determined Garibay was the (one) who attempted to kill Edeza the day before," Del Toro alleged. Detectives do not believe that the victim and assailant knew each other. A status conference was set for April 29 and a preliminary hearing for May 3.